Victor Hugo would still be able recognize his favorite restaurant, Le Grand Véfour, in the Palais Royal complex. 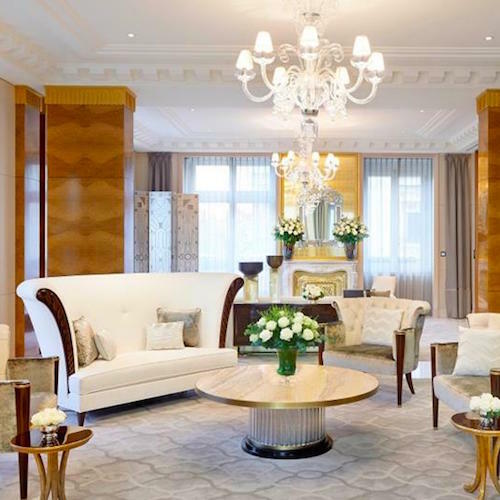 Founded in 1784, just in time for the French Revolution, Le Grand Véfour has welcomed its fair share of celebrities — from Napoleon and Josephine to Colette to Jean Cocteau. In fact, many of the restaurant's chairs bear a brass plaque to commemorate the famous patrons who once dined here. They say this is where Napoleon Bonaparte proposed marriage to his Josephine. 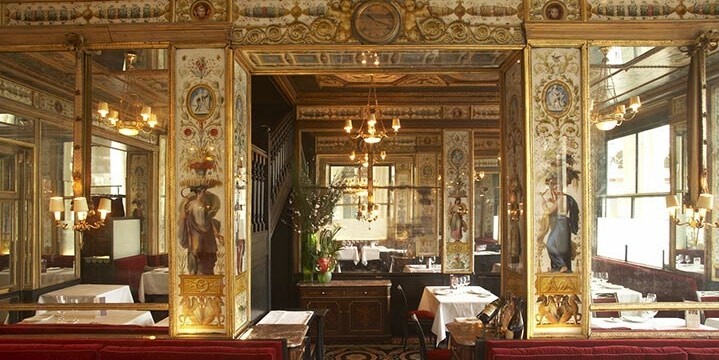 Overlooking the gardens of the Palais-Royal and featuring exquisitely adorned etched mirrors, gilded decor, and delicate hand-painted panels, Le Grand Véfour is one of the most beautiful restaurants in Paris. In 1984 the Taittinger champagne family bought the then run-down restaurant and restored its glorious 19th-century interior with an all-encompassing renovation. Against the opulent surroundings, chef Guy Martin's menu has a contemporary feel, blending sophistication and sensuality. After almost a decade as a 3-star restaurant, Le Grand Véfour lost its third Michelin star in 2008. No matter — we think 2-star restaurants may try even harder. You can still enjoy the dazzling decor and Chef Martin's classic dishes like foie gras raviolis with truffle cream sauce; Pigeon Prince Rainier III, deboned pigeon stuffed with foie gras, black truffles, and veal; or parmentier de queue de boeuf aux truffes, an opulent interpretation of shepherd's pie with oxtail meat and truffle-laced potato purée. Also on the menu is Martin's famous sweet artichoke pie and the hazelnut, milk chocolate pastry with caramel ice cream and Guérande sea salt. Not surprising, the selection of cheeses from Chef Martin's home region — the Savoie , in the French Alps — is unsurpassed. The impish chef with the tousled mop of hair is a bit of an outsider in the circle of Michelin star chefs. For starters, he has no formal training and began his culinary journey baking pizzas in his native Bourg-Saint-Maurice in the French Alps. Instead of attending cooking school, Guy Martin taught himself to cook by methodically working his way through the 5,000 recipes found in a classic French cookbook called Gastronomie Pratique — Practical Gastronomy. With only this "practical" experience, Guy began his career in the kitchens of Relais & Chateaux resorts. By the time he was 26 he had secured his first Michelin star while chef at the fairytale Chateau de Divonne, near Lake Geneva. Five years later, he got a second star. 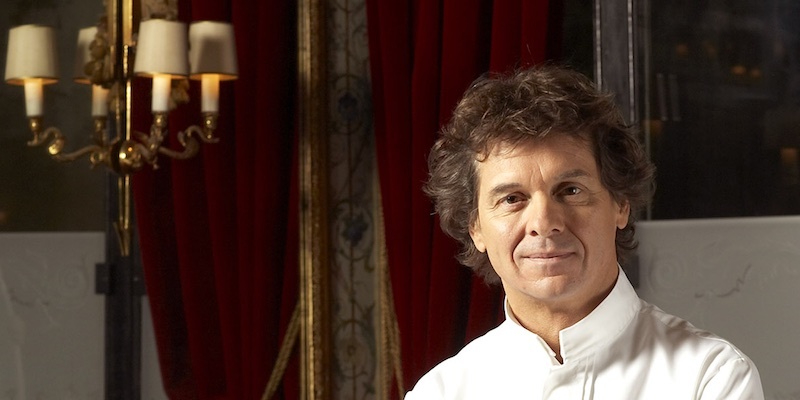 In 1991, the Taittinger group brought this hot young chef to Le Grand Véfour, with hopes he would add some Michelin magic to the restored historic restaurant. It took almost a decade, but by 2000, Chef Guy had three Michelin stars to show for his hard work, the highest accolade possible. Malheureusement, in 2008 Le Grand Véfour was stripped of its third Michelin star. It was big culinary news, with headlines announcing the restaurant was "no longer fit for a king". 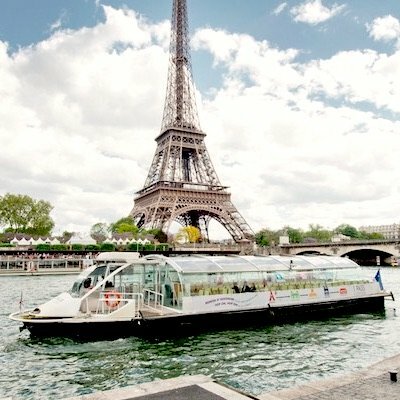 Chef Martin purchased Le Grand Véfour in 2011 and now also owns a clutch of restaurants in Paris and French Polynesia. Bonaparte and Josephine, Lamartine, Hugo, Sartre… For more than two centuries the legend of the former Café de Chartres has grown ! Today Guy Martin maintains the aura: influenced by travel and painting — colors, forms, textures — the chef "crunches" his plates like an artist, somewhere between invention and great history."